Belgium, perhaps Bruges, ca. 1440. Mid 18th-century red morocco with gilt dentelle border and spine. Written for a lady whose patron was Saint Andrew; David Henriquez de Castro; his sale, Amsterdam, Apr. 26, 1899, lot 543; Bernard Quaritch, London catalogue 190 (1899), no. 6, facsimiles, I, 1900, plate 7; purchased by J. Pierpont Morgan (1837-1913) in 1900, possibly from Quaritch; J.P. Morgan (1867-1943). 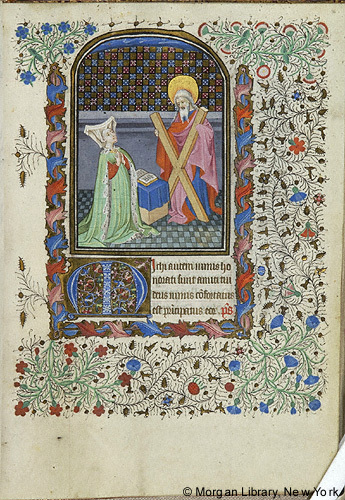 Ms. book of hours for the use of Rome (Hours of the Virgin, Office of the Dead); written and illuminated in Belgium, perhaps Bruges, ca. 1440. Decoration: 7 full-page miniatures, 12 large miniatures. Artist: two Masters of the Gold Scrolls, the second responsible for the last four Suffrage miniatures on fol. 159v, 161v, 163, 165v; the Masters of the Gold Scrolls were a group of Netherlandish illuminators who were active 1414-1455, partiularly in Bruges; the name is derived from their treatment of background, flat color decorated with golden foliated ornament.